In the last 3 years, through various good health and fitness trainings at work, I cut down on carbs, ate more small meals, did 3x cardio/week, started regular pilates in the last 1.5 years and I am definitely fitter than I used to be and managed to slow down the rate at which I gained weight. But I guess stress at work and sedentary office work lifestyle doesn’t help, and chubbiness is still a big struggle. Tried as I may, I could not really lose enough weight for my wedding as well. Thank God my hubbubu loves me for who I am 🙂 From 2 years ago, I told myself to first get into the discipline of regular exercise and good sleep before investing in a personal trainer, so, here I am! I have been some of my friends go through some amazing transformation over the years like Miss D.C. ,and I have reached a stage in life that there is enough “thinking” about what it would like to be fit, but I need to start “doing” and becoming “fit” to fulfill all the roles in my life – as a good steward of the life and time God has given me in different forms of ministry work (formal/informal), as a wife, (in future, if God blesses) as a mum, as a daughter, as an employee, as a manager and mentor of others, as a friend, as an avid explorer, as a blogger. I need to be physically able to have energy to do all these roles well. Am I fearful? Of course. What if I write all of these, and even with this training, my efforts to lose weight and become fitter fail like I previously did? Even writing this post makes me feel so vulnerable and potentially judged by many of you reading. But I am learning to let go – there is no perfection to this fitness journey. I wasn’t blessed with fast burning genes like many of you, and wasn’t wise enough to be very active in my school days. But this journey isn’t about how I look anymore, or trying to gain more acceptance by being slimmer; I must root my identity in Christ alone. The journey is about me becoming a better steward of my health and energy, pushing my mental boundaries to achieve fitness milestones I never thought was possible. 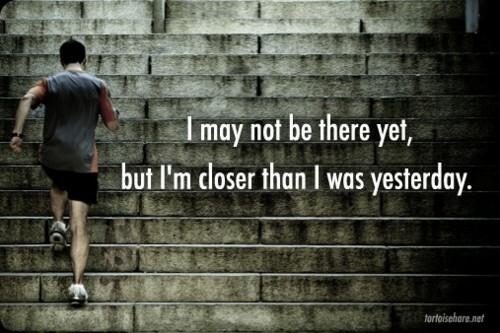 Because it is a journey, it only matters that I am better than I was yesterday. *Pics are not mine. Source are stated in the pictures.